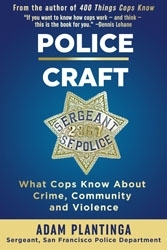 A veteran police officer gives his thoughtful, balanced views on police shootings, racial profiling, community relations, and every other aspect of policing in the new book "Police Craft: What Cops Know About Crime, Community and Violence" by Adam Plantinga, sergeant, San Francisco Police Department. Published by Quill Driver Books; publication date Dec. 1, 2018. Fresno, CA, November 28, 2018 --(PR.com)-- Police work is perhaps the most controversial profession in America, which is why the American public needs to better understand how police officers work and think, says San Francisco police sergeant Adam Plantinga in his new book "Police Craft: What Cops Know About Crime, Community and Violence" (Quill Driver Books, publication date December 1, 2018, paperback, $16.95). Plantinga, a police officer for 17 years, a serving sergeant with the San Francisco Police Department, and author of the acclaimed "400 Things Cops Know," presents a thought-provoking and revelatory examination of policing in America in his new book "Police Craft." Mystery writer Dennis Lehane, author of "Gone, Baby, Gone," "Mystic River" and "Shutter Island," described "Police Craft" as "Highly readable, fun and informative ... If you want to know how cops work -- and think -- this is the book for you." Writing with honesty, compassion and humor, Sgt. Plantinga shows what the police officer's job looks like from the inside. Each chapter tackles a specific element of the police officer's job, ranging over a wide range of topics: how police officers are recruited and trained, how investigations are conducted, handling of evidence, the techniques and culture of policing, the sociology of crime and addiction, the realities of danger and violence, and more. The work is hard, frustrating and often futile. The psychological toll of dealing with danger, violence and death is considerable. The longer police officers stay on the job, the greater the tendency to cynicism and burnout. And there is always the possibility that any encounter with the public can go terribly wrong. As Plantinga writes, "People outside of the police sphere want cops to do a whole lot better; cops inside that insular world know that the public is lucky it works out as well as it does." Not hesitating to confront controversial issues, Plantinga presents a police officer's views on police shootings, racial profiling, and relationships between police and the community -- and offers reasoned proposals on what the police and the public can do better, including better training, greater transparency and improved leadership. Hard-boiled, sincere and surprisingly funny, Plantinga wrestles with the complexities and contradictions of a job he loves in which he witnesses so much suffering. Transcending today's strident pro-cop/anti-cop rhetoric, "Police Craft" will give every reader a greater respect for the police and greater understanding of the job they do. Adam Plantinga has been a police officer for 17 years and is currently a sergeant with the San Francisco Police Department. Plantinga's first book, "400 Things Cops Know," received rave reviews from star crime writers such as Lee Child, Edward Conlon and Joseph Wambaugh and was hailed as "the new bible for crime writers" in The Wall Street Journal. Plantinga lives in the Bay Area with his wife and daughters. 6" x 9" trade paperback, 245 pages, index. Also available in e-book formats. Available now on Amazon.com, BN.com, IndieBound.org and wherever books are sold.